KANSAS CITY, Mo. — The southwest corner of a parking lot at W 50th and Main will not become a hotel any time soon. City plan commission meetings usually don't have a turnout like the group of people who showed up Tuesday morning. Nearly every row was filled with folks against a proposed hotel at the site. "I chose this neighborhood because it is a neighborhood," one resident said. Neighbors from the surrounding condominiums say a five-story, 151 room hotel does not fit. 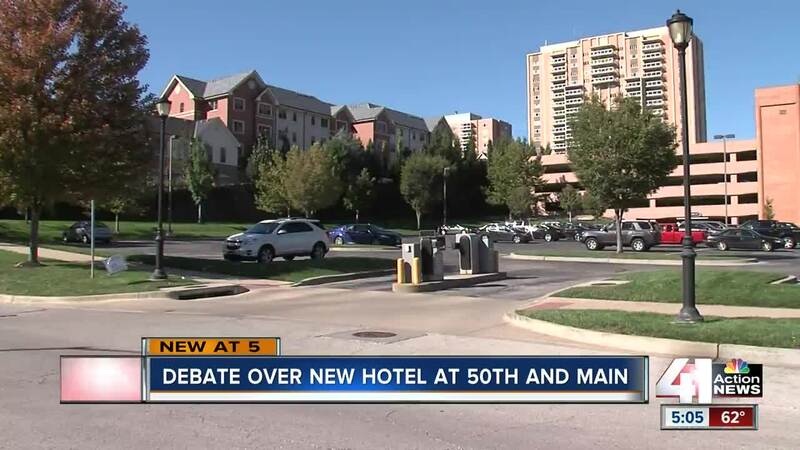 They raised concerns about increased traffic and pointed out a Midtown Plaza Area study that indicates residential use is best for the area. "Development needs to enhance and not detract from a neighborhood, and this was not the right piece," said Keith Spare, president of the South Plaza Neighborhood Association. The concept would include Tru and Home2 Suites, brands of Hilton. It would include an indoor pool, and there were suggestions for a coffee shop and another retail concept. The developer, KWB LLC, continued the meeting from the end of summer so they could meet again with residents, but that never happened. Folks said they never got a chance to hear about an updated traffic study because the developer never contacted them. Residents told 41 Action News the developer tried to go straight to the full city council but were sent back to the plan commission. "You indicate you're going to meet with the neighborhood and then you don't. There's a consequence to that," said Babette Macy, chairwoman of the commission. Commissioner Coby Crowl said they wasted everyone's time. Polsinelli Law Firm, representing the developer, said they understand the neighbors' frustrations, but said they did all they could in terms of revisions to the height and style of the building. "Again, as we said, we went back, took a look at the orientation. We looked at it with city staff, and I don't believe there's any orientation that changed the concerns that neighbors have with this development," said Roxsen Koch with Polsinelli. "They simply don't want a hotel." A city staff member pointed out that the zoning trumps any Midtown Plaza Area study, which drew some incredulous gasps from the crowd. "They betrayed the neighborhood and they betrayed the developer," said Spare of the staffer's comment. The commission unanimously voted 'no' and is recommending that the full city council denies the request for rezoning. Connie Campbell, whose condo butts up to the back of the parking lot, says her belief in democracy was upheld with the vote. "They could have said the zoning allows it, so we're going to do it. Instead, they really heard us but most importantly, this commission cares about Kansas City as a community and I feel really validated by city government," Campbell said.